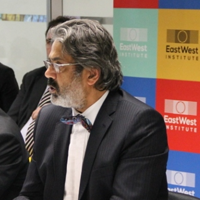 The EastWest Institute’s Brussels Center and the Hanns Seidel Foundation convened the roundtable discussion “Security Threats in Central Asia and Prospects for Regional Cooperation,” on January 28, 2015. Vice President and Director of Regional Security Ambassador Martin Fleischer presented EWI’s activities in the region, introducing a keynote speech by Ambassador Miroslav Jenča, Special Representative of the UN Secretary-General for Central Asia and head of the United Nations Regional Centre for Preventive Diplomacy for Central Asia (UNRCCA). The high-level event was enriched by comments from Mr. James Appathurai, Deputy Assistant Secretary General for Political Affairs and Security Policy, and Secretary General’s Special Representative for the Caucasus and Central Asia, NATO; H.E. Mr. Homayoun Tandar, Ambassador of Afghanistan to the European Union, Belgium and Luxembourg; and H.E. 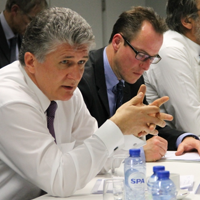 Mr. Rustamjon Soliev, Ambassador of Tajikistan to the European Union, Belgium and Luxembourg. The roundtable discussion was moderated by Mr. Christian Forstner, head of the Hanns Seidel Foundation’s Brussels Center. Ambassador Fleischer outlined the prospects for stability and cooperation in Afghanistan and Central Asia, presenting the steps taken by EWI’s Afghanistan Reconnected Process. This initiative aims at forging regional economic cooperation to minimize the economic impact of security transition in Afghanistan in the years to come, by engaging governments, Members of Parliament and private-sector leaders from the region. The Afghanistan Reconnected Process has identified energy trade and transit, cross-border trade facilitation and investment in regional transport infrastructure as most urgent areas of cooperation that can contribute to enhanced cooperation and economic security in the region. In 2015, EWI will undertake comprehensive regional advocacy and outreach missions for the implementation of the priority measures identified, with the private sector as main driver of the economic cooperation agenda. While recognizing the value of EWI’s initiatives in the region, Ambassador Jenča acknowledged the increasing complexity of Central Asia and the need for more regional cooperation, in the interest of stability. The situation is not only related to the completion of NATO’s combat mandate in Afghanistan, the withdrawal of troops and the potential security implications on Central Asia, but also to other regional and broader challenges. In particular, the presence of Central Asian foreign fighters in the Middle East, the crisis in Ukraine, the falling ruble and prices of oil and gas, as well as the decreasing remittances of labor migrants from Central Asia in Russia also had a significant impact on the region and its stability. Beyond the issue of regional cooperation, Ambassador Jenča wondered if countries of the region truly identified with Central Asia as a region. The lack of regional structures, limited cooperation, communication, transport links and cross-border trade, which stagnates at about 6 percent of total trade in each country, seem to suggest that this is not the case. The slow progress of the CASA 1000 and TAPI projects exemplify the skepticism encountered by cross-border initiatives, which require further stability and international community involvement to succeed. At the same time, Ambassador Jenča mentioned that the main challenges and obstacles to stability often lie within Central Asian states. The succession of political leaders, socio-economic problems, marginalization, shortcomings in the rule of law, religious extremism, inter-ethnic tensions and organized crime are issues which need to be addressed by the countries in the region in particular through preventive efforts, which UNRCCA promotes. Moreover, the more stable, democratic and prosperous the countries will become, the more resistant they will be to external threats. Despite the risks and threats faced by the region, Ambassador Jenča stressed that Central Asian states had made continuous progress in the past 20 years and had managed to keep the region stable. In this respect the international community needs to build upon and sustain the developments achieved in the region. As Central Asian states continue to diversify their foreign policy and partners to face increasing challenges, the EU has the opportunity to become an even more attractive partner in the region, and may consider more targeted support to Central Asia. The ensuing discussion referred to the challenges posed to the region by unresolved border disputes, tensions over the use of common water resources and energy needs, marginalization and human rights questions, drug trafficking, terrorism and other forms of organized crime. Such trends continue to undermine regional stability and require concerted efforts by all countries of Central Asia to develop effective responses. The regional dimension of the threat of violent extremism was strongly remarked, in light of the possible return of over 2,000 fighters from the region who joined the IS insurgency in Iraq and Syria. In addition, Ambassador Soliev noted that IS has announced future actions in Pakistan and Afghanistan, raising the level of alert of neighboring countries. A recent meeting of deputy foreign ministers from the region has discussed the issue at length in Ashgabat, Turkmenistan. In addition, developments in Afghanistan are affecting security in Central Asia as a whole, as there is a potential threat of terrorist and extremist actions related to lesser control over the Afghan territory after the withdrawal of the International Security Assistance Force (ISAF). In this respect, Ambassador Tandar stressed the key role of Afghanistan, which he described as “The Shield of Central Asia” in the fight against terrorism. Speakers agreed that ISAF and the international community have not successfully addressed narco-trafficking stemming from Afghanistan during ISAF’s mandate, and that it is having an impact outside the country’s borders, feeding organized crime in the region and beyond. As the NATO presence decreases, poppy cultivation is increasing—as forecasted by UNODC, whose regional program on the topic is coming to an end. These developments may exacerbate the already fragile security situation in the region. Further commitment is therefore required from the international community. NATO is available to provide support to Central Asia in relation to narco-trafficking, as well as in the field of border control and transit through training and mapping exercises. However, its involvement should not be seen as part of a zero-sum game by other influential actors in the region, as it will not be embedded in a political agenda. It was also mentioned that Central Asian states can play a more important role in stabilizing Afghanistan, using their comparative advantages of geographical proximity, cultural similarities, and potential for mutually beneficial regional cooperation. Countries in the region are already involved in Afghanistan’s energy, infrastructure, transport and capacity building, but further engagement is necessary. These countries, however, need to be supported by the international community in order to harvest the fruits of regional cooperation. In particular, Afghanistan needs to be better engaged in regional processes and relevant regional initiatives. At this critical time, international support for concrete projects is needed more than ever. Speakers agreed that Central Asian states feel they need to survive between two powerhouses: Russia and China. The former’s influence in security and politics is great, and the latter’s economic clout is growing continuously. This often puts countries in the region in front of difficult choices. For example, Ambassador Jenča referred to Kyrgyzstan’s decision to join the Eurasian Economic Union, as well as China’s pledge of 3 billion dollars for projects in the region, through its Silk Road Initiative. Central Asian states are strengthening ties with these partners, while others’ commitments to the region have been less consistent. In particular, the US’ interests in the region remain unclear, while the EU needs to show itself as a more appealing partner, beyond its ongoing engagement in the area. Particular attention was paid to the EU’s involvement in Central Asia, thanks to the contribution of Members of European Parliament Dorfmann and Zeller from the audience. More specifically, they highlighted how the EU is lagging behind Russia and China in the establishment of its priorities in the region. After the launch of the EU Strategy for Central Asia in 2007, its role was largely neglected until the current Latvian EU Presidency, which has committed to producing a more focused updated strategy by the summer. The EU has nonetheless expanded its assistance to Central Asia, and the European Parliament has been supporting the region’s path towards democracy. 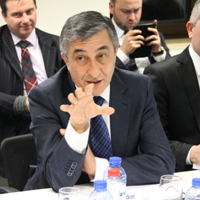 Moreover, Ambassador Soliev reminded the audience about the upcoming EU-Central Asia High-level Security Dialogue, to be held on March 11, 2015, in Dushanbe, Tajikistan. Ambassador Jenča stressed fostering cooperation and establishing partnerships as fundamental factors for advancements in the region. In particular, he recognized the commitments in this direction made by Afghanistan’s President Ashraf Ghani, who, since his inauguration has conducted numerous international missions aimed at strengthening ties with neighboring countries. Moreover, looking at the region as a whole, Ambassador Jenča concluded that cooperation between states in the region is an absolute priority for stability, and that the implementation of national reforms is key. In this sense, in the margins of the conference, the UNSRSG and EWI formed a partnership for the final and critical phase of the Afghanistan Reconnected Process, aiming at advocating for reforms with governments in the region. By sharing the policy recommendations developed by business leaders from Central Asia and neighboring countries with concerned national administrations, the initiative will promote and support change towards enhanced economic cooperation and stability for the region.